Non-Dairy Butter, Cheese, Cream, Margarine & Yoghurts | Is it vegan? In Japan you can find many plant-based dairy alternatives, including plant-based margarine, soy yoghurt, and soy cream. Below are some examples of the products available. The Kyoto 100% vegan and gluten-free cheese restaurant CHOICE has handmade, small batch fermented vegan butter spread for sale online and in their restaurant. The required frozen shipping is not cheap, but the quality of their products is exceptional. They sometimes sell their products at vegan food festivals. • Marin Foods My Tasty Vegan Soft. Ingredients: Digestion resistant dextrin, vegetable oil, refined processed oil, salt, emulsifier, spices, coloring (carotin). From their website: “It is a healthy vegan spread that does not use animal origin ingredients nor use 27 allergenic ingredients. (The same line manufactures products that include milk and soy, but we practice a thorough cleaning before making this vegan soft.) It has reduced cholesterol, and 60% less calories compared to soft-type margarine products based on the standard tables of food composition in Japan. Dietary fibers that are difficult to take with the ordinary diet are included in this vegan soft.” This product can frequently be found at AEON supermarkets. Photo from Marin Foods’ website. There is more information about Marin Foods’ vegan series of products (cheese, margarine and hotcakes) on their website (English). Meiji makes a margarine that appears possibly to be vegan, although the package does not specify what type of refined processed fats and oils are used. 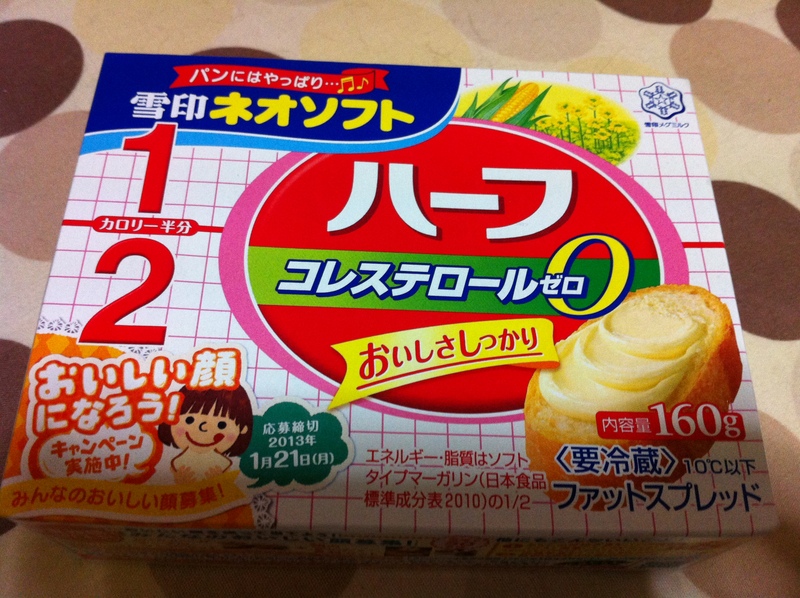 •Meiji Cake Margarine/明治ケーキマーガリン. Ingredients: Edible vegetable oils and fats, edible refined processed fats and oils / emulsifiers (derived from soybeans), flavouring, colorants (β-carotene). Costco in Japan stocks Nuttelex. It’s necessary to have a membership to shop there. Nuttelex Buttery Spread with Olive Oil is currently selling for 600 jpy for 1 kg. Below is an example of a vegan margarine found in some specialty and health food stores. • Sokensha Fermented Soymilk Margarine/発酵豆乳入りマーガリン. Ingredients: Edible vegetable oil (safflower oil), refined edible oil (palm oil), fermented soymilk (fermented with plant lactic acid bacteria), salt/lecithin (from non-genetically modified soybeans), antioxidant (tocotrienol). Package says RSPO certified sustainable palm oil and 100% plant-based ingredients are used. The Kyoto 100% vegan and gluten-free cheese restaurant CHOICE has handmade, small batch vegan cheeses for sale online and in their restaurant, with the exception of seasonal flavors like cherry blossom. Seasonal flavors can be obtained by signing up for their email magazine. The required frozen shipping is not cheap, but the quality of their products is exceptional. Staff learned cheesemaking from Miyoko Schinner of Miyoko’s Kitchen, the American vegan cheese company. They sometimes sell their products at vegan food festivals. We recommend the koto. The following photos are courtesy of CHOICE. • CHOICE’s Fromage, Smoky/CHOICE’s Fromage スモーキー. Ingredients (raw materials): Cashew nuts, nutritional yeast, rapeseed oil, white miso, agar agar, natural salt, sunflower lecithin, tapioca powder, xanthan gum, smoke solution, lactic acid bacteria (derived from grain), turmeric. (Name of additive used and its purpose): Agar agar(coagulant), tapioca flour (coagulant), nutritional yeast (seasoning), sunflower lecithin (emulsifier), xanthan gum (thickener), turmeric (coloring matter). Recommended to pair with whiskey, wine, Japanese sake or shochu, as well as with grilled vegetables, or for use as a salad toppings. Also recommended on top of rice with a few drops of soy sauce. • CHOICE’s Fromage, Italiana/CHOICE’s Fromage, イタリアーナ. Ingredients (raw materials): Cashew nuts, dried tomato, nutritional yeast, basil, natural salt, garlic powder, lactic acid bacteria (derived from grain). (Name of additive used and its purpose): Nutritional yeast (seasoning). Recommended as a spread, for use with pasta, mixed with dressing or sauce, used in lasagna or gratin or in a sandwich. • CHOICE’s Fromage, Koto/CHOICE’s Fromage, 古都. Ingredients (raw materials): Cashew nuts, coconut oil, nutritional yeast, Japanese peppercorns, natural salt, powdered Japanese pepper, lactic acid bacteria (derived from grain). (Name of additive used and its purpose): Nutritional yeast (seasoning). Recommended not only to put on bread and crackers, but also to eat with fresh vegetables. Goes very well with sake or sparkling wine. • CHOICE’s Fromage, Rum Raisin/CHOICE’s Fromage, ラムレーズン. Ingredients: Cashew nuts, raisins, soymilk, agave syrup, rum, natural salt, lactic acid bacteria (derived from soybeans). Made with organic raisins soaked in rum. Recommended to eat with bagels, scones, pancakes, or between cookies or crackers, with coffee, tea or wine. Can also be used in homemade sweets. 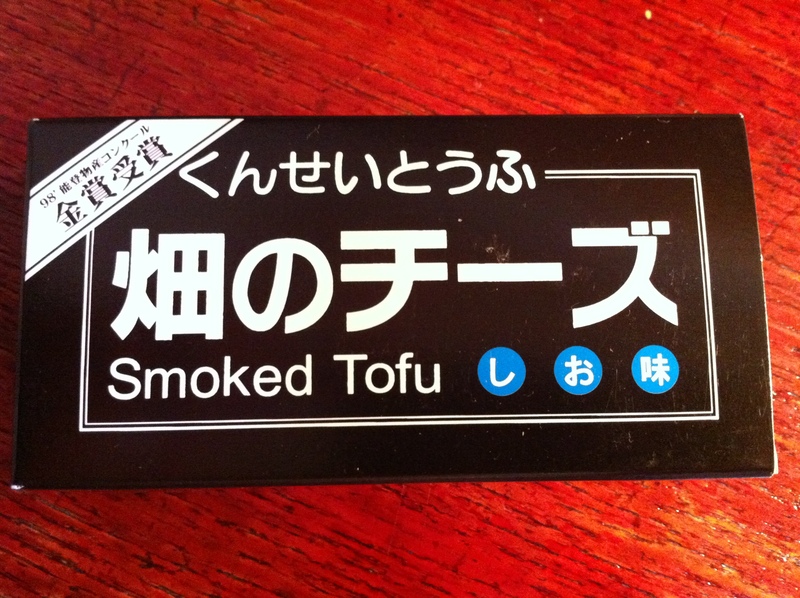 While not exactly cheese, this smoked tofu would go well with crackers etc. It was in a small shop in Kanazawa and may be available elsewhere in Japan. • Field of Cheese – Smoked Tofu (Salt Flavoured)/くんせいとうふ　畑のチーズ. Ingredients: Domestic soybeans, natural bittern (nigari), deep water sea salt. Note the other flavours may not be vegan. 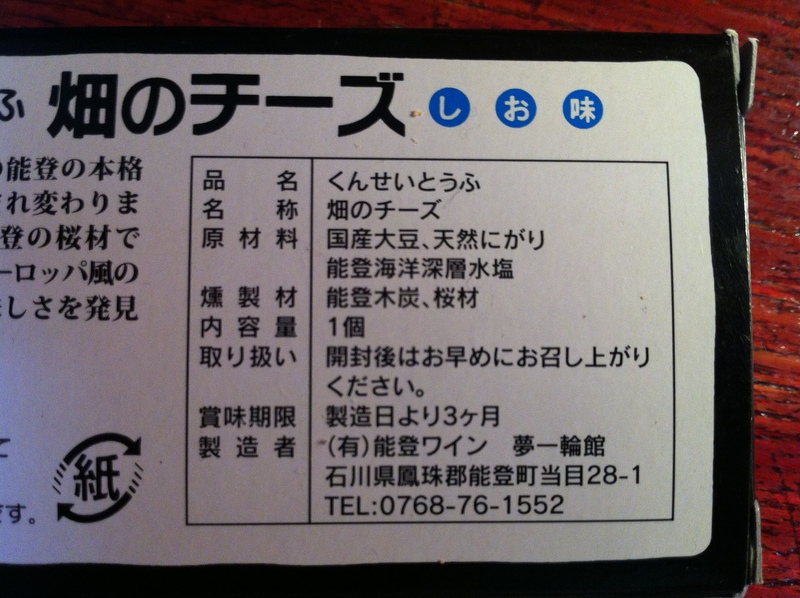 The “ishiri” flavour is made with squid per their website. • Kempo Instant Cashew Cheese/建歩 インスタント・カシューチーズ . Adding water makes a cheesy sauce that goes well on quiche, pizza or pizza toast, pasta or potatoes, or can be used as a sandwich spread. Available online at Kempo’s website (Japanese). It’s also possible to order in English by messaging Sheila Kawakami on Facebook. Photo courtesy of Kempo. • Marin Foods My Melting Vegan Shred– 99% reduced cholesterol. Ingredients: vegetable oil, processed almond, salt, fermented seasoning liquid, yeast extract powder, modified starch, pH conditioner, cellulose, seasoning (organic acid etc. ), spices, coloring (carotin). This plant-based shred “cheese” has 99% less cholesterol than gouda. It doesn’t use animal ingredients or any of the 27 “allergenic ingredients.” Intended for melting- the website suggests using it on pizza toast or gratin. Allergens listed as none: dairy is used in the same factory, but they practice thorough cleaning before making this product. Photo from Marin Foods’ website. Sometimes spotted in AEON supermarkets. A 60 year-old tofu company called Sagamiya is currently selling various soy cheeses in regular supermarkets across Japan. LiveKindly has an interesting article on some of their Beyond Tofu products here (English).They can also be bought in their online shop. Note that their Nomu Tofu drink is not vegan as it contains honey. Although they sell a product called Beyond Tofu, the company has no relation to the American company Beyond Meat. Beyond Tofu products can frequently be found at AEON supermarkets. • Sagamiya Natural Mozzarella-like Burrata Tofu/相模屋 モッツァレラのようなナチュラルとうふ ブラータ仕立て is supposed to be a tofu that’s like a burrata or mozzarella-style cheese, but the texture is not close to cheese at all. Still, it only retails for about 200 yen, so perhaps it’s worth a try. Ingredients: Tofu cream, maltose, table salt, agar agar, modified starch, coagulant (crude seawater magnesium chloride (natural bittern(nigari))), polysaccharide thickener. 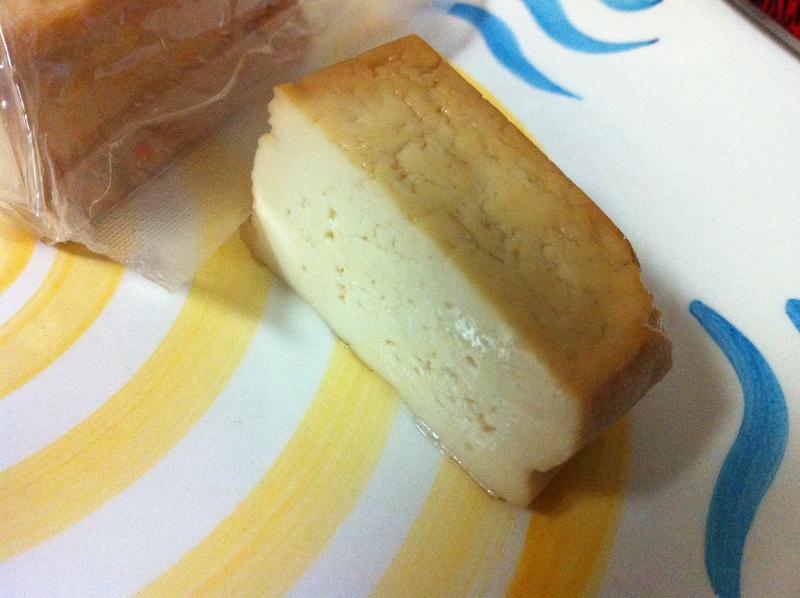 • Sagamiya Natural Mascarpone-like Tofu/相模屋 マスカルポーネのようなナチュラルとうふ is not extremely close in taste to actual cheese but it has a nice texture and pleasant flavor with no soybeany taste. Seems to retail for about 200 yen as well. Marked “vegan,” “100% dairy-free,” “gluten-free,” and “lactose-free” in English on the package. Sagamiya Beyond Tofu is a plant-based “cheese” in block form/ブロックタイプ, cube form/キューブタイプ, and as a “pizza” called Beyond Pizza that consists of shreds on a piece of agedofu (fried tofu) that you heat up at home. • Sagamiya Beyond Tofu block/Beyond Tofuブロックタイプ. Ingredients: Fermented soymilk food product (soymilk (contains soybeans), starch, yeast extract), vegetable oil, starch, starch syrup powder, table salt/thickener (modified starch), coagulant (magnesium chloride (natural bittern(nigari))), pH adjuster, carotenoid pigment. Product contains soybeans. • Sagamiya Beyond Tofu Cubes/Beyond Tofuキューブタイプ. Ingredients: Fermented soymilk food product (soymilk (contains soybeans), starch, yeast extract), vegetable oil, starch, starch syrup powder, table salt, thickener (modified starch), coagulant (magnesium chloride (natural bittern(nigari))), pH adjuster, carotenoid pigment. Product contains soybeans. • Sagamiya Beyond Pizza. Ingredients: Fried tofu (soybeans (not genetically modified)), fermented soymilk food product (soymilk, starch, yeast extract), vegetable oil, starch, starch syrup powder, table salt, thickener (modified starch), coagulant, pH adjuster, carotenoid pigment. Sheese, the vegan cheese from the Isle of Bute, Scotland, is available for purchase in Japan online from Green’s Vegetarian and can also be found at vegan food festivals. Photo taken at National Azabu grocery store in Hiroo, Tokyo. • Terra Foods Just Like Cheese(Maru de Cheese)/Terra Foods まるでチーズ. Ingredients: soymilk (from non-GMO soybeans), vegetable oil, starch, dextrin, salt, yeast extract, pH adjuster. This tasty product is similar in taste and appearance to a white hard cheese. Can be melted or eaten as-is and used in salads, pastas, on nachos, and so on. It can be found in smaller health food shops or ordered online at the above link. Photo on left from Terra Foods’ website. Photo on right courtesy of Vege Project Japan. Japan also has a unique creation called tofu misozuke. It originated in Fukuoka Prefecture and is basically tofu that has been aged and cured in miso for at least 2 months, and up to 2 years. It can be made with a few variations to produce different ‘cheeses’. It can be hard to find in Japan, but you can make it yourself if you find a recipe online. It’s also possible to place bulk orders from overseas websites to get many popular brands that are not sold in Japan delivered here, including Miyoko’s Creamery, Field Roast, Follow Your Heart, and others. Tokyo Vegan/Vegetarian Friends Club Facebook group has a guide to ordering from veganessentials.com (US) or www.veggie-shop24.com (EU) here on their blog (English). According VeganEssentials.com’s customer service, they recommend DHL priority shipping for cold items, which should generally arrive in 3-4 days. They try to ship only on Monday or Tuesday so the items can arrive in the same week and not sit over weekends. They can provide shipping estimates when emailed a shipping address and list of desired purchase items. They do also ship to Japan via priority mail, but it can take up to 7-14 days, which might not be good for cold food items if they are warm in transit. Soy yoghurt is available in Japan, but look out for gelatine. • Marusan Soymilk Yoghurt/Marusan 豆乳グルト. Ingredients: Soymilk (Canadian soybeans, non genetically-modified). In 2018, the company stated that in the past, they once did a joint research project outside the company with a university, which included animal testing using their yoghurt. They do not currently do any animal testing. They have not decided if they will ever do animal testing again in the future. It appears that Marusan provided this yoghurt for animal testing on request by the researcher. The researcher stated that he gave rats feed which included the Marusan soy yoghurt, which they could eat freely in their cage. He worked in accordance with the animal welfare regulations of the university. After 5 weeks he killed the rats and examined the organs. He thanked Marusan for providing the soy yoghurt needed for the research. The original research report is here (Japanese). This means that the product itself was not developed using animal research. • Marusan Soymilk Yoghurt with 100% Domestically Produced Soybeans. 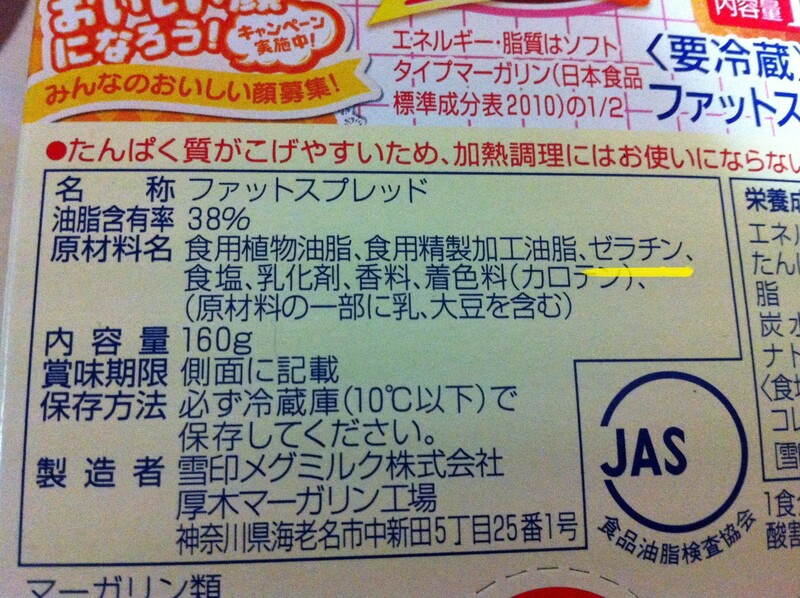 Ingredients: Soymilk (Domestically-produced soybeans, non genetically-modified). The package says 乳成分不使用／dairy components not used. Vegetable-derived lactic acid bacteria is used to ferment the product. There are some other soy yoghurts out on the market in Japan, although they are not as easy to find in stores as Marusan yoghurt. AEON is a good place to look for soy yoghurt. The following product is carried at AEON and MaxValu stores, as well as a small handful of other shops which are listed at the link below (Japanese). • Horimilk Soy Flora/ホリ乳業 ホリビオティック ソイフローラ. Ingredients: Domestic soybean powder (not genetically modified), sugar. It does not contain preservatives, so has a relatively short shelf life of 18 days. The same company also makes another type of soy yoghurt. This has been spotted in some AEON stores. • Horimilk Whole Soybean Yoghurt/ホリ乳業　大豆のまるごとヨーグルト. Ingredients: Soybean powder (not genetically modified), sugar, flavouring. This soy yoghurt uses 100% North American soybeans of the highest quality, finely powdered using a patent protected production method, and patent pending lactic acid bacteria. No dairy products or coagulant are used. The whole soybean (except the skin) is used so it’s rich in soy protein, isoflavones and dietary fiber. • Pokka Sapporo Soyafarm Soymilk Yoghurt / Pokka Sapporo Yogurt made with soy milk in plain, aloe and blueberry flavors is not vegan as it contains gelatin. Aloe and blueberry photos from Pokka Sapporo’s website. The product also bears the “Tokuho (food for specified health use)” mark, which looks like an outline of a person stretching. The Consumer Affairs Agency says that the use of the Tokuho (food for specified health use) mark does not require the conduct of animal experiments, and if there is enough history of humans having eaten the food, animal experiments are unnecessary. However, in reality many animal experiments are being conducted. There is more information about the Tokuho mark and how to find if specific companies conducted animal experiments in order to receive the mark here (Japanese). A product not bearing the mark is not evidence that no animal experimentation was done to create the product. As of 4/19/2019, the following product has been reported to contain animal-derived lactic acid bacteria. • Pokka Sapporo Soybio Soymilk Yogurt, Plain Unsweetened/ Pokka Sapporo ソイビオ豆乳ヨーグルト プレーン無糖. Ingredients: Soymilk, dietary fiber (product contains soybeans). This product has been spotted at some Aeon and Maruetsu supermarkets. The small containers of Pokka Sapporo Soybio Plain (Sweetened)/Pokka Sapporo ソイビオ豆乳ヨーグルト プレーン加糖 and Pokka Sapporo Soybio Strawberry/Pokka Sapporo ソイビオ豆乳ヨーグルト ストロベリー are not vegan as they contain gelatine. There are also some drinkable soy yoghurts on the mainstream market, although they aren’t very common. • CGC Drinkable Yoghurt/CGC のむ豆乳ヨーグルト. Ingredients: Soybeans (grown in Kyushu, not genetically modified), sugar/stabilizer (polysaccharide thickener), acidulant, flavouring, cellulose, emulsifier. Soymilk was fermented with lactic acid bacteria for a refreshing taste. Uses Kyushu-produced “Fukuyutaka” soybeans. • Fruta Fruta Coconuts Guruto/Fruta Fruta ココナッツグルト. Ingredients: Coconut milk, agar agar, psyllium seed coat powder. Available exclusively at Aeon and Aeon Style stores in Honshu and Shikoku. Photo from Fruta Fruta’s website. Available at Bio C’Bon grocery stores. Marked gluten-free and vegan in English on the packages. Natural/プレーン. Ingredients: Coconut milk, tapioca starch, vegan yogurt cultures. Vanilla/バニラ. Ingredients: Coconut milk, tapioca starch, agave syrup, lemon juice, vanilla beans, flavouring, vegan yogurt cultures. Mango/マンゴ. Ingredients: Coconut milk, tapioca starch, mango, agave syrup, lemon juice, flavouring, vegan yogurt cultures. If you want to try to make your own yoghurt, unfortunately, vegan yoghurt starters don’t appear to be available from regular grocery stores, but you can definitely get them on iHerb. This one was found at a Bio C’ Bon grocery store and it’s also available on the Ohta website. This starter for soymilk yoghurt uses plant material to grow yoghurt starter bacteria and lactic acid bacteria. Milk is not used. Below is some soy whip cream that is available in Japan. This appears to be the only choice available on the mainstream market. • Sujahta Non-Dairy Soy Whipped Cream/スジャータ 乳製品を使っていない豆乳入りホイップ. Ingredients: Vegetable oil, organic soymilk, sweeteners (oligosaccharides, maltose, sugar), emulsifier (derived from soy), stabilizers (modified starch, polysaccharide thickener), metaphosphoric acid Na, flavouring. Note the maltose is from corn/potato/sweet potato and the modified starch is from cassava. It is not known whether the flavouring is vegan.